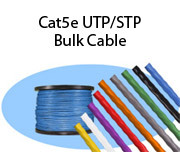 Stonewall offers a full line of Category 5e UTP/STP bulk cable, patch cables, connectors and tooling. 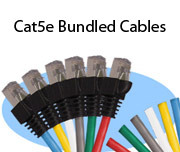 All cable assemblies are available in any length! 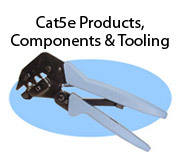 You may also want to consider our Category 6 or Category 6a product lines. 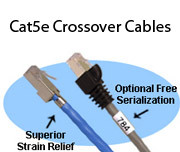 Both are fully compatible with both Cat5 and Cat5e cable. Most orders ship within 3 days. 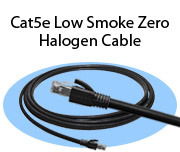 Cat5e Solid Cable is recommended for all horizontal runs, between wiring closets, and for lengths over 25 feet. Maximum recommended length is 100 meters (328 feet). It should not be flexed. 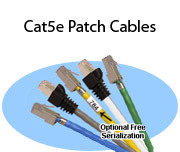 Cat5e Stranded Cable is built to withstand the repeated flexing, common in PC to wallplate applications, without damage to inner conductors. Because of higher attenuation it is recommended for short runs of 25 feet or less. Plenum rated cable is generally required in all air returns, dropped ceilings and public buildings. Fire codes vary from area to area, if unsure check with your local Fire Marshall.